Cast of characters provides a great combination. Embracing Mike Tyson's idiosyncrasies. 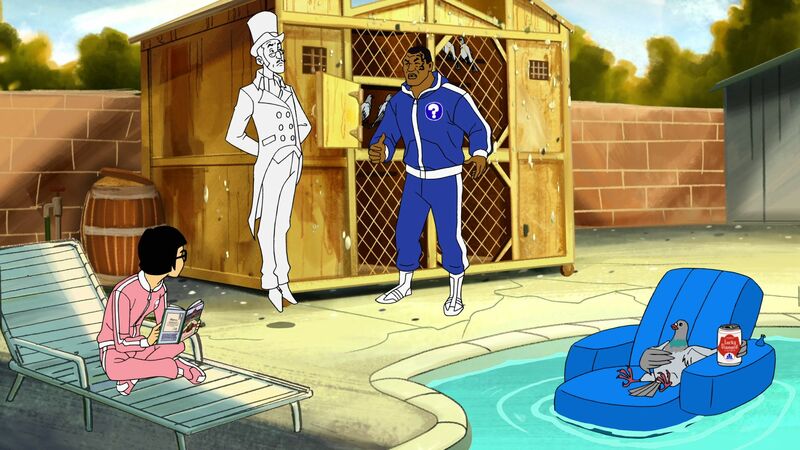 Mike Tyson Mysteries: The End is the series premiere of this animated Adult Swim show airing on Cartoon Network. It features Mike Tyson playing himself but in the role of solving bizarre mysteries at the request of clients. He doesn’t work alone as his team is almost as bizarre as the cases they have to work on. His team is composed of the Marquess of Queensberry, a high-class ghost who also serves as an adviser; Yung Hee, Mike Tyson’s adopted daughter who was left on his doorstep as a baby; and Pigeon, a man who was somehow transformed into a pigeon by his ex-wife. This episode opens up with them lounging around the pool when Mike decides it’s time to check his pigeon coop. It’s filled with pigeons, and all of them are carrying messages so the team has been falling behind in responding to requests. The one he reads first is from an author, Cormack McCarthy, who is having trouble writing an ending to his book and wants Mike Tyson and his team to come visit him to help. Pigeon points out the fact that a professional writer asking a retired boxer to help with his book is an unusual request but Mike couldn’t be more ecstatic. Yung Hee isn’t as excited because the two of them were supposed to be looking at brochures of potential colleges she could attend since she’s 18 but he promises they”ll do so after the case. Can the crew help this author rediscover his mojo or is there more to this request than they know? I was really looking forward to checking out this episode because this series seemed to have all the right ingredients for some truly hilarious scenarios. And this episode definitely had the look and feel of an old Hanna Barbera cartoon such as Scooby Doo but it was the Mike Tyson version complete with foul language. It started off ok with Pigeon initially being the funniest, and just his entire predicament being a pigeon has a lot of potential. He’s sarcastic and crude, which means he’s there to provide even more of an edge to the show than Tyson, who plays the role as the slow-witted but good-hearted bruiser. As the episode progressed some of the humor was hit and miss but I started enjoying it more when it begin to embrace everything that is funny about placing Mike Tyson in that role, including some action. So whether it was his active imagination or difficulty in pronouncing certain words, the humorous situations started to hit a little harder. And the supporting cast is filled with unique characters so they all bring something to the table. The actual mystery was okay but set the tone for what can be expected in the series. So I can see even better episodes ahead and I’m looking forward to what mysteries will be next for them to solve. 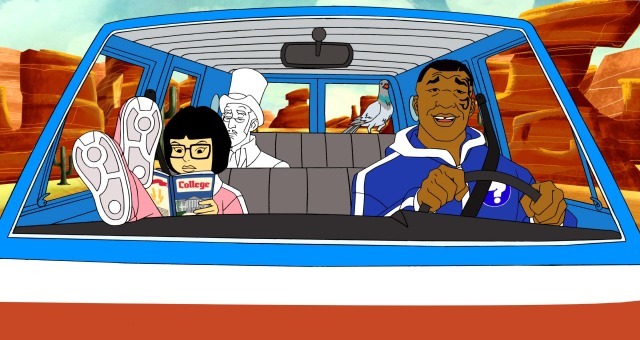 Mike Tyson Mysteries: The End is an enjoyable episode that makes me want to see what’s ahead in this series as the cast works and fits wonderfully together, providing laughs in their respective roles. The mystery this episode didn’t provide the funniest situation but once Mike Tyson’s characters idiosyncrasies were embraced the mystery became much better due to the strength of that. So it was a decent start and with the basic introductions out of the way I’m looking forward to what future bizarre situations the team will find themselves in.